Project roslyn is bringing good news. A lot of new features are coming up and you can check the status on GitHub (not all features are guaranteed to make it in time). I created a GitHub project – brunolm/csharp-features to show what is coming and how to use it. This entry was posted in General and tagged .net, .net-core, c#, c#-7.0, roslyn on February 21, 2017 by BrunoLM. What are extension methods? How/When to use them? Extension methods are methods that can be created extending existing types without the need to inherit from a class and creating your own custom logic. It can also be applied on interfaces. Extension methods enable you to “add” methods to existing types without creating a new derived type, recompiling, or otherwise modifying the original type. That means we can extend methods from any type, even types where we don’t have access to the source code. Extension methods are a special kind of static method, but they are called as if they were instance methods on the extended type. We build extension methods by declaring it as a static method, but there is a little tweak makes it compile into a method that can be called from an instance. 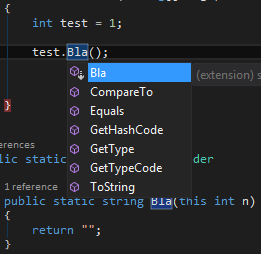 This entry was posted in General and tagged .net, c#, extension-methods on May 15, 2015 by BrunoLM. These are just a few things you can do with it. In this post I’m going to show a simple example on how to use it to get descriptions on enums. This entry was posted in General and tagged .net, c#, reflection on March 18, 2015 by BrunoLM.